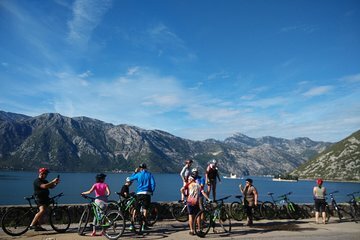 Erkunden Sie die Bucht von Kotor auf eigene Faust bei einer selbstgeführten Fahrradtour. Mit Tipps und Karten der Gegend von einem Mitarbeiter, radeln Sie rund um die Küste der Bucht. Entscheiden Sie sich für die Fahrt nach Muo und Prcanj, die Kirche unserer lieben Frau in Prcanj, Perast, Siedlung Dobrota. Machen Sie eine kurze Fahrt mit der Fähre in der Bucht. Fahren im Ihnen angenehmen Tempo. Excellent!! Vladamir was there to meet us, and gave us all of the information that we needed to do our own bike tour. One of our highlights from our cruise!! Would definitely recommend this tour if you like to do your own thing! Kotor is absolutely beautiful!! Wonderful way to see a Kotor, beautiful place. We biked as far as we could go. Got out of the tourist area, stopped at a little store bought a ham sandwich and a beer and sat by the water and chilled. This place is an eyeful of beauty. The operators were very nice, courteous, and accommodating. What I really liked about it was, you can't get lost. Just follow the water, and you will be fine. I would recommend this tour and would do this again. We were met on time and shown to our bike. They were reasonably decent mountain bikes and we were given helmets (not the best but ok) and a map. Vladimir then suggested a couple of routes plus places to swim and eat, then off we went. A fab way to see the bay. Highly recommended! This was a great way to experience Kotor. What a beautiful place! I loved this day!! The bay was absolutely beautiful. We went for a swim and had a lovely lunch beside the bay coming home. It was a highlight of our trip. I would do it again in a flash !! We actually switched to the 25 turns trip down the mountain face, it was exhilarating! Beautiful scenery, breathtaking bike ride! The Bay of Kotor is beautiful and the ride was nice. Beaches aren't a sandy beach, but very rocky, or you can enter the water from many cement docks around the bay. The self guided tour man was very nice and accommodating, however, one of our bikes broke halfway through the ride, so we had to meet up with him and exchange the bike for another one. The quality of the other bikes were sub par, but they worked. We were met on time by the tour representative. He had several size bikes available so that we could be properly fitted and gave us a map with the suggested route which was absolutely beautiful. As well, he told us that we could have the bikes as long as we wanted and he would walk back to the square every half hour. He also provided us with helmets and a lock, if we wanted to stop along the way. Would highly recommend biking as a fabulous way to see Kotor.